Cause of Death: Face smashed in by a rock attached to a chain by Malcolm Dragon. Other Distinguishing Features: Assassin wears a full bodysuit of armour. Assassin was charged by OverLord with the task of killing CyberFace when he was the primary rival for leadership of the Vicious Circle. He ultimately failed in this task but remained within the criminal organization. 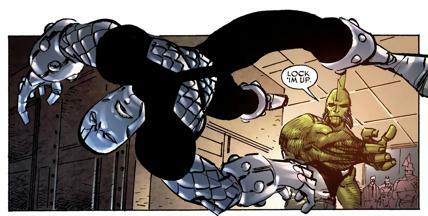 Assassin was one of a small faction of the Vicious Circle that remained loyal to OverLord, even after his death, and refused to follow the rule of CyberFace. Dragon recruited this faction of the Vicious Circle when he led a rebellion against CyberFace, eventually removing the villain from his position as ruler of the world. Assassin stayed with the Vicious Circle but was betrayed by OverLord III for refusing to move away from his criminal ways. He was delivered to the Chicago Police Department by OverLord’s ill-fated Dragon Army. Assassin is present when Dart II kills FirePower and assumes control of the Vicious Circle. Assassin is later part of the scouting party sent to find Malcolm Dragon. He is killed when Malcolm hits him with a rock attached to a chain.